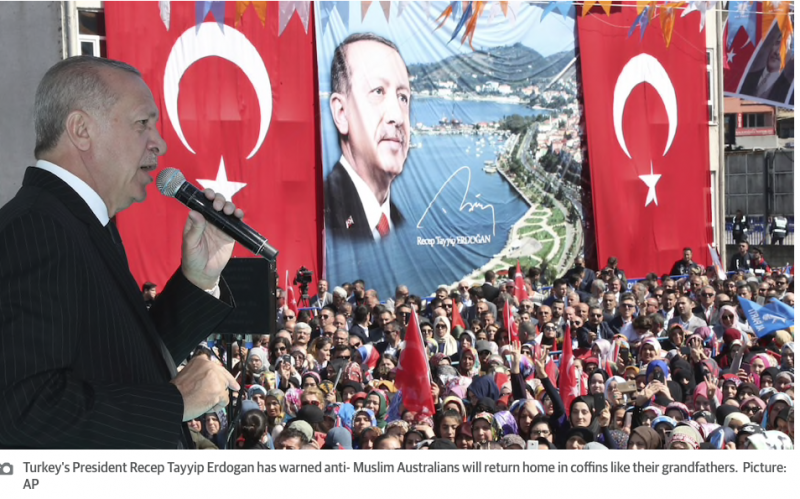 Daily Mail (h/t Sara S) Erdogan has inflamed previously-warm diplomatic ties by referencing the sacred Gallipoli campaign of 1915, during a public address on an outdoor podium, following last week’s Christchurch mosque massacre in New Zealand. Your grandparents came, some of them returned in coffins,’ he told a rally featuring people waving Turkish flags. ‘I find the comments deeply offensive but also unhelpful. I think it’s our job here not to escalate this. It’s our job to take the temperature down,’ Mr Morrison told Sydney radio 2GB broadcaster Alan Jones on Wednesday. The Prime Minister confirmed he would summon the Turkish Ambassador to Australia today over the ‘very offensive comments’ made just five weeks before Anzac Day. 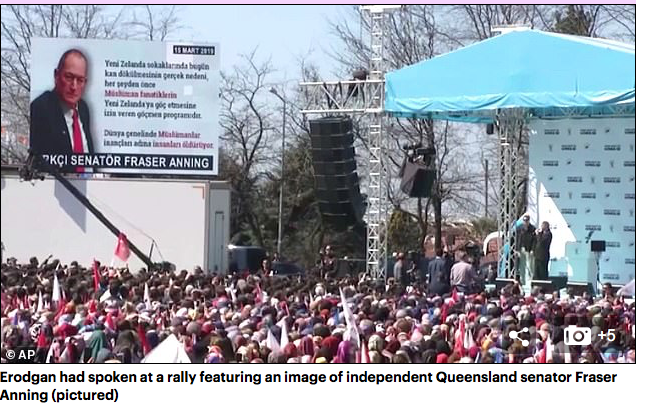 Erodgan had spoken at a rally featuring a screen image of independent Queensland senator Fraser Anning (above), who has been widely condemned in Australia for releasing a statement on Friday equating the Christchurch shootings with ‘the growing fear within our community, both in Australia and New Zealand, of the increasing Muslim presence’. Mr Morrison said Erdogan’s comments were add odds Turkey’s secular founder Mustafa Kemal Atatürk, who in 1934 said soldiers who died at Gallipoli were ‘in the soil of a friendly country’ at peace. Don’t forget that Erdogan is supported by the majority of the Turkish people. He is an islamofacist but not a dictator. My ears bleed every time I hear Erdogan speak. Erdogan is an islamofascist. libtards like Morrison, Arden and Trudeau appeasing this and “welcoming” hundreds off thousands of islamofascist fanatics. The libtard traitors are destroying western democracy. The muslims will never be integrated. They will be at best an eternal nuisance to busy praying to the moon God to be of any use, at worst committing mass murder, mass rapes and bringing the west into civil war just like in the shitholes they come from. Obviously the ranting Islamist Turkish Prime Minister knows very little of his own country’s history if he thinks Turks were victorious in that WW1 campaign. The Ottoman Empire paid a heavy price for their victory: an estimated 250,000 Turkish and Arab troops were killed or wounded defending Gallipoli. It’s amazing how many incompetent heads of state there are in the world. Even more amazing that people actually vote for them. To: Ross_Trantor. If the Turks were not victorious in that WW1 campaign, who was? Do you call 87,000 killed a win? The Turks won. Loss of life is tragic. Turks won that particular battle – which would actually have been difficult for them or anybody else to lose in that situation,.. They were firing on home soil DOWNHILL from the tops of cliffs and sand hills onto soldiers landing in boats and having no cover on the beaches. Soldiers who were unable to retreat. and technically , as 2/3 of the ottoman divisions that fought against allied troops were arab and not Turk – the Turks did not win on their own. yet they still managed to end up with 87,000 fatalities. Turks may have won that battle but they lost the war as history shows. Ross-Trantor. Thank you for the information. My grandad fought there with the Royal Dublin Fusiliers. He is in the British Commonwealth Graves site in Alexandria, Egypt. I think a first strike with a cobalt jacketed thermonuclear device on erdogans head would be a great way to celebrate ANZAC day. As far as Erdogan goes: those who can, do. Those who can’t, run their mouths. Every now & then the Muslims drop the ‘peaceful’ BS façade ….. and reveal their true agenda. Let’s hope the sheeple are taking some notice. Unfortunately our PM Morrison is a sheeple…..
You meant to say “traitor”.